With all the ink-spilling about “pause” or “no pause”, it’s nice to have a clear and simple bet to take a look at. Details on the bet are below—together with a clean version of the NOAA temperature record—but why don’t you first check out the back-to-back pieces in the Seattle Times (this column and this op-ed) about the revenue-neutral carbon tax ballot measure campaign I’m part of in Washington State? 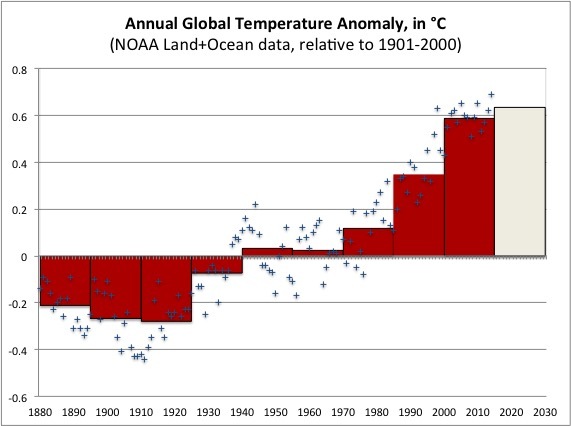 Details: We’ve agreed to use this NOAA dataset of global land-ocean temperature anomalies, and the bet (which Bryan and I made in June, see more here) is pretty simple: We look at the average temperature anomaly for the 15-year period 2000-2014, and then we look at the average temperature anomaly for the follow 15-year period (2015-2029), and if the difference is more than 0.05C then I win $333.33; if it’s equal to or less than 0.05C then Bryan wins $1000. Ditto for Alex, except he talked me into odds of 5-1 instead of just 3-1, so it’s $1000 from me against only $200 from Alex. More Twistory below, stay tuned for an update in January 2016! Wow Yoram. That bet looks like taking candy off a baby to me. Only 0.05! If Bryan or Alan want to repeat the bet in size, then I would be happy to take the other size: basically at any amount. Of course, while I feel that this is one of the best bets in history, the downside of being right is that it confirms the scientific consensus of unabated global warming. While the idea that the current hiatus will continue indefinitely appears to me to be nonsense, in some ways it is a shame that they will in all probability be proved wrong. Lets plan for climate change instead of wasting our time trying to stop it. Best were going to do is slow it down, and Im not convinced that is even possible. To me, changing the conversation to slowing climate change and reducing all pollutants for other reasons may be a more realistic and fruitful goal. The climate change fear is great to piggy back on for overall ecosystem service sustainability, but I’m having a hard time holding on to the idea that it is possible to stop human induced climate changes, or slow it down, given the insufficient response of all nations. An honest person would have to say that every decade our scientists are making instruments with better precision than the decade before. You would agree, right? Therefore, the older that the temperature data readings are, the more questionable they are. Certainly the left half of the graph is useless. 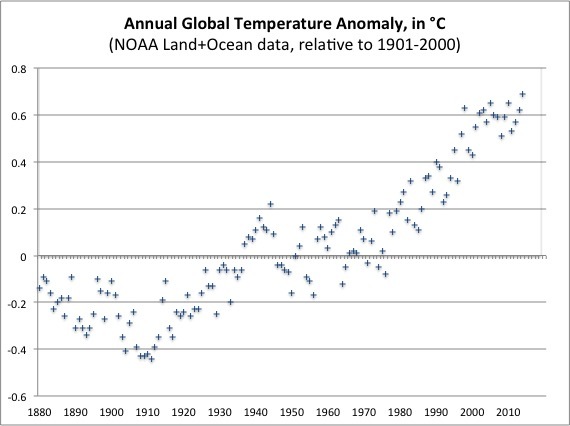 And the graph of questionable temperature readings speculates that the supposed change over 130 years is LESS THAN 1 degree Centigrade. Not so much to worry about. Your increasing temperature argument is based on an assumption that the precision of thermometers made 130 years ago are equal to the precision of thermometers made today, which we have already concluded is false. Therefore this whole premise of climate change based on a possible slight increase in temperature is specious at best. And who are you to say what the IDEAL Climate should be anyway? With people starving in the world, perhaps a growing season that is 1 or two days longer might reduce starvation. This is nothing more than a tax scheme.